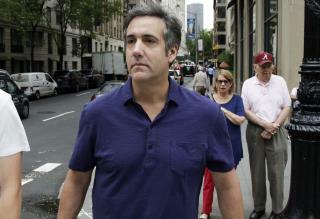 (Newser) – An ex-judge reviewing over four million items seized from President Donald Trump's former personal lawyer for attorney-client privilege said Thursday that her work is finished, the AP reports. Attorney Barbara Jones revealed in a letter in Manhattan federal court that she has completed her review of designations by lawyers for attorney Michael Cohen, Trump, and the Trump Organization. Prosecutors have said they are investigating possible fraud in Cohen's business dealings. He has not been charged. After the April 9 raid of Cohen's office and residences, Cohen asked a judge to give him a role in deciding what seized items were privileged and could not be seen by prosecutors. The judge appointed Jones. The final batch described by Jones Thursday contained nearly 5,000 items designated as privileged by Cohen or Trump. Jones agreed with nearly half of the designations, saying 1,972 were privileged and 285 were highly personal. She did not agree that 635 other items also were highly personal. She finished the letter by saying: "The Special Master has concluded her review." Neither Cohen nor Trump contested any of her designations by appealing her findings to US District Judge Kimba M. Wood, who assigned Jones to the task and decided that any disputes would be handled publicly, except for the contents of the items. In all, lawyers for Cohen or Trump challenged roughly 14,000 items out of over four million electronic communications, documents, recorded conversations, videos and other items. LOL. Boy they are working hard to unseat a sitting president. It is a terrible display of the challenge we have right now as a country. They will find something. They have to. They have invested and built this case and if nothing is found it will validate how truly wicked this effort to unseat the president is against our country. All that effort with the FBI, FISA, Fusion GPS, Ohr at the State Dept., Brennan.... To provide an opportunity to crawl into every crack of a candidate; then sitting president. I know this outlook won’t be popular on this site. However, I doubt any politician could survive this type of scrutiny. Remember when they reported off shore accounts a few years ago and tons of elected on both sides had accounts. All of them would be hit with income / tax evasion. That is the whole reason this effort was set up. To find something, anything, but it won’t be collusion with the Russians. We’ll see, but so far very weak case. Tic tic tic bye bye Trumputin Mueller coming for you. Cohen is going DOWN ! !